Engage The Culture! : How Do You Spell S-U-C-C-E-S-S? As we approach the Halloween and Thanksgiving holidays, there is an important principle about success in life that we can learn from pumpkins! My family and I went to the New England States Exposition a few weeks ago and we saw a pumpkin that weighed over 1,000 pounds. It was enormous and very impressive! I’m told that the world record for giant pumpkins is held by Chris Stevens of New Richmond, WI. His pumpkin weighed in at 1,810 ½ pounds. That could make a lot of pumpkin pies for Thanksgiving! 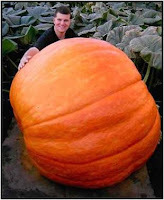 The first time I saw a winning giant pumpkin at a county fair I asked the grower how he was able to grow it that big. He told me it wasn’t really too difficult. You start by getting the right kind of seed. You have to water it and fertilize it. But, the key is that you must pinch off all the blossoms except one so that all the energy of the vine goes into that one plant. When I asked him why farmers don’t grow more giant pumpkins like that, he explained that they don’t really taste very good, and they are extremely difficult to move. Many of the “rich and famous” who our culture idolize as great successes have followed the Giant Pumpkin Principle. They have become “super-successful” in one area of life, but dismal failures in other areas. In order to get to where they are, they had to “pinch off” various facets of their lives so they could focus on just one thing – making lots of money, or standing out in the arena or on the ball field or golf course, or being masters of their craft on the silver screen or in a recording studio or on the political stage. Some Christians have done the same thing when it comes to building a ministry. Unfortunately, in many cases, their personal relationships with family members, friends and others are woefully deficient. They receive accolades, win awards, and usually have impressive resumes, but they spend their energies on what is of value in the temporal world only and miss what is of value from an eternal perspective. About the only thing they are really good for is showing off! As Christians, we don’t need to be super-successful in one area. We need to be moderately successful in many areas. We don’t need lots of money . . . or fame . . . or influence to be truly successful in life. We need something different. Job was a tremendously successful man in the eyes of all those who knew him or knew of him – including his friends, Satan, and God. He had immense wealth, extensive business holdings, political and moral influence over others, and a large and thriving family. His friends regarded Job as a Giant Pumpkin. To them, he was great because of the size of his estate and the reach of his influence. Once his wealth and his health were taken away, they turned what had been respect for him into scorn and derision. Have you considered my servant Job? There is no one on earth like him; he is blameless and upright, a man who fears God and shuns evil. Does Job fear God for nothing? . . . You have blessed the work of his hands, so that his flocks and herds are spread throughout the land. But stretch out your hand and strike everything he has, and he will surely curse you to your face. Have you considered my servant Job? There is no one on earth like him; he is blameless and upright, a man who fears God and shuns evil. And he still maintains his integrity, though you incited me against him to ruin him without any reason. After those things were taken away, however, the real nature of Job’s success was revealed. It was not because of the abundance of his possessions or the influence he had over others in the political or business spheres. It was because of the integrity of his character. True success is revealed most clearly after it has come through a time of testing. So, how is success really spelled? I-N-T-E-G-R-I-T-Y!